Advancing the reform of the rural land system is a significant component of the strategy and an important supporting mechanism to accelerate the modernization of the country’s agriculture and rural areas. “Rural vitalization” was proposed as one of the major strategies of developing a modernized economy in the report delivered to the 19th National Congress of the Communist Party of China (CPC). Advancing the reform of the rural land system is a significant component of the strategy and an important factor in accelerating the modernization of the country’s agriculture and rural areas. Due to issues concerning decision making rights of rural land use and the direct interests of land users, the reform could make a big impact on many aspects of society. The reform of the rural land system starts with a change in land use rights. Before the beginning of the reform and opening up in 1978, China adopted a land policy featuring highly centralized farmland ownership and operation. Farming issues such as how to use the land and what and how much to grow were all determined by the production team of the rural people’s communes. Farmers had to follow schedules arranged by the production team to conduct work. This system’s lack of flexibility and inability to arouse farmers’ enthusiasm caused output to fall far short of the huge food demands of Chinese people at that time. China began to implement the household contract responsibility system (HRS) and divide property rights of rural farmland into two layers: The land is collectively owned by a rural community, normally a village, and usage rights are held by an individual household that contracts a piece of land from the village. This change has resulted in impressive achievements in grain production. However, with the rapid development of industrialization and urbanization, many rural residents have migrated to the cities and left their farmland unattended. There has been a growing demand from rural residents to gain the ability to officially transfer their idle farmland. Since the 18th CPC National Congress, under the premise of adhering to the collective ownership of farmland, the CPC Central Committee has managed to separate the contract and management rights of the rural farmland, gradually forming a system for separating ownership rights, contract rights and management rights for contracted land, which was hailed as another major institutional innovation after the HRS. The separation of the three types of rights allows farmers to retain the contract right over their land and transfer only the management right if they choose to lease the land to others, which has greatly liberated farmers and improved the rewards of land usage. At present, more than 30 percent of rural households have transferred their contracted land, a total of 31.93 million hectares. The big change in the rural land system has activated rural resources, promoted the development of rural enterprises and boosted the rural economy. However, during the process, new problems have emerged. For example, considerable farmland has been contracted for extensive industrial and commercial use, causing a major loss in arable land. Furthermore, the farmers’ land contract rights are not comprehensive property rights with clear definition. The land contract period is relatively short. In some places, farmers’ contracted lands are fragmented and divided into different plots, which is not conducive to land transfer and large-scale agricultural operation. Additionally, farmers’ idle residential land and houses in rural areas are not allowed to be transferred to urban residents, except for farmers without housing in the same village, which has prevented some farmers from reaping benefit from their residential land. When he presided over a symposium on rural reform in 2016, Chinese President Xi Jinping, also general secretary of the CPC Central Committee, called for more to be done to advance rural reform, with the core work to properly address the relationship between farmers and land. To solve problems that have long plagued farmers, agricultural operation and industrial integration, the report delivered by Xi to the 19th CPC National Congress announced that rural land contracting practices would remain stable and unchanged on a long-term basis. And the current round of contracts will be extended for another 30 years upon expiration. evidencing the central government’s strong determination to protect farmers’ land rights and interests. The report also stressed that China would advance the reform of the rural land system and improve the system for separating ownership rights, contracting rights and management rights for contracted rural land, which is meant to rationally optimize land resources by consolidating the basic rural operation system in such areas. With improved separation of the three types of rights, more land management rights can be activated. Rural collective economic organizations are provided greater access to properties that can be controlled, and all the people involved in rural land contracting and management have more defined roles to play. By freeing up management rights such as land transfer, the reform has laid a solid foundation and generated great support for attracting industrial capital to rural areas, improving management efficiency of the farmland and increasing farmers’ incomes. 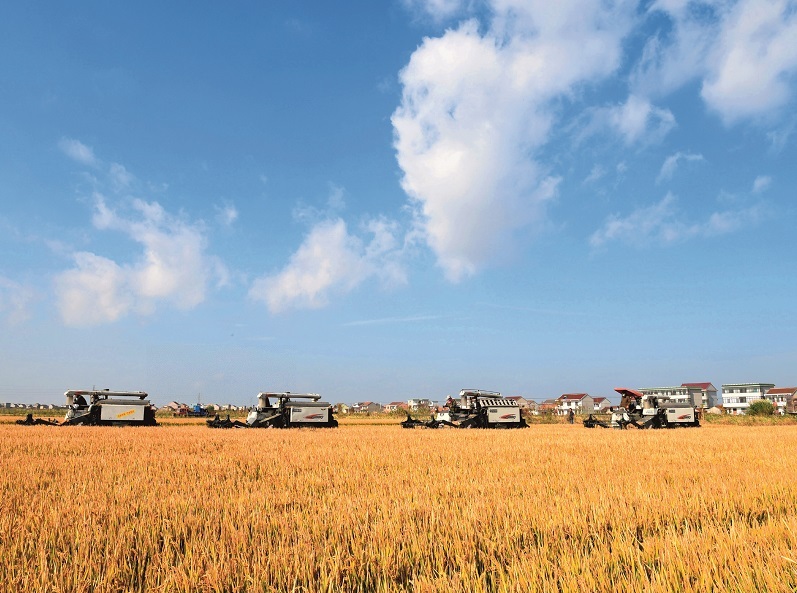 In recent years, the central government has increased efforts towards the farmland system reform. For example, by carrying out pilot programs for confirmation, registration, and certification of farmers’ rights to their contracted land, it aims to protect farmers’ land rights, facilitate land transfer, promote large-scale agricultural operations and improve the efficiency of the agricultural economy. By the end of September 2017, the land area that completed right confirmation had reached a total of 72 million hectares in China, accounting for 80 percent of the land area specified in the second round of the contract. In addition, the central government has chosen 33 regions to carry out trial reforms on rural land requisition, marketization of rural collective land designated for commercial construction and the system for managing rural residential land, aiming to expand the land management rights of rural collectives and improve farmers’ earnings from their contracted land. Through these efforts, the government will end the monopoly on the supply of rural construction land, step by step. Furthermore, the government will also gradually abolish excessive restrictions on rural households’ rights to their residential land by allowing urban residents with capital to cooperate with farmers to expand utilization of farmers’ residential land and houses, improving the market value of farmers’ assets. More than 16.7 million hectares of residential land can be found in China’s rural areas. By making optimal use of the regulatory role of market mechanisms, the new policy will ensure that land is used more effectively. The author is a research fellow of the Rural Development Institute at the Chinese Academy of Social Sciences (CASS).